Classification of neoplasma, Diagnosis of malignancy, Prognostic markers, Predicting response to treatment, Detection of metastases, Screening of inherited cancer syndromes, Neurodegenerative diseases, Brain trauma, Muscle diseases, Amyloidosis and Dementias. Fluorescein-labeled oligonucleotide probes used for the detection of RNA or DNA by In Situ Hybridization (ISH). These probes allow the localization of specific nucleic acid sequences within cells from formalin-fixed, paraffin-embedded tissue sections. When used with the ISH Detection systems, these probes offer reliable, highly sensitive and easy-to-perform DNA and RNA assays. Prenatal diagnosis, Cancer diagnosis, Molecular cytogenetic of birth defects and mental retardation, The identification of specific chromosome abnormalities, The characterization of marker chromosomes, Interphase FISH for specific abnormalities in cases of failure, Cytogenetic and Monitoring the success of bone marrow transplantation. They can be grouped into stains for detection of microorganisms, connective tissues and lipids, carbohydrates, amyloid and minerals, pigments and miscellaneous. 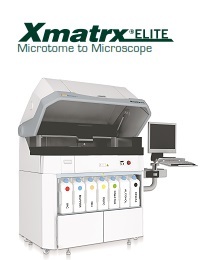 Fully Automated System from Microtome to Microscope. All-in-One All-at-Once IHC, ISH, FISH, SS, Multiplex Stains and Co-detection. 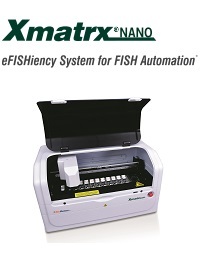 eFISHiency System for FISH Automation. 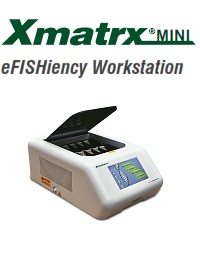 All-in-One FISH, in situ PCR and ISH. eFISHiency Workstation. All-in-One FISH, in situ PCR and ISH. BioGenex develop, manufacture and market highly innovative and fully automated systems for cancer diagnosis, prognosis and therapy selection: the Xmatrix systems. In addition, BioGenex also offer a broad range of histology products for immunohistochemistry [IHC], in-situ hybridization [ISH], miRNA, in situ PCR, multiplex and special staining of tissues including more than 300 primary antibodies, nucleic acid probes, detection systems, ancillaries and consumables that provide high quality, standardized, reliable and consistent results.